Think you're too old for backpacks? Nah! Backpacks are lifesavers. You can load 'em up with work files, books, a laptop and you're set for the day. 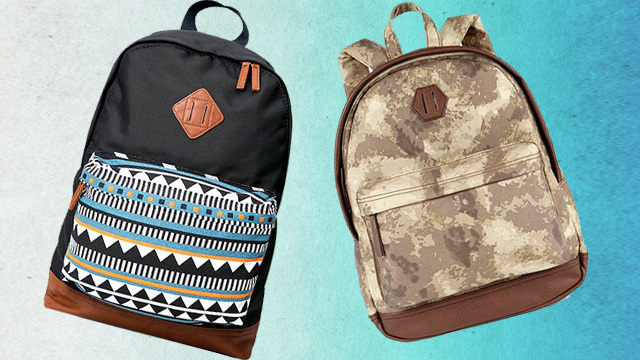 Choose a shoddy, musty backpack though, and you could ruin your #OOTD. If you'd like to avoid that problem, have a look at these knapsacks below—said to be the ten coolest today, as listed by our pals at Spot.ph! If you're looking for a backpack with a unique design, we found the one for you. The print does remind us of a mud lake—a very nice pattern for a mud lake! Are plain backpacks too basic for you? Add a pop of print and color to your look with this one! We totally love the subtle skull print on this backpack, and we're not even into dark themes. Going for a rugged yet stylish look? This canvas backpack with leather accents is what your outfit needs! French street style is in—and you can never go wrong with it. If you're looking for a grab-and-go type of bag, this convertible one is for you. Sling it over your shoulder if you're in a rush, but you can also go two-strap in a snap! Do you think you're too old for backpacks? This one is so sleek it will make you change your mind. Add a refreshing twist to your look—go for this light-hued backpack that will keep you looking fresh and neat! This sleek backpack is perfect for guys on the go. Also, it has a compartment inside to keep your files tidy! If you're a quirky guy, we know you won't settle for anything basic—this funny-face backpack will reflect your personality and definitely keep you out of the boring zone.